Oscar Robertson’s early childhood was spent in a segregated housing project in Indianapolis. As a young kid, Robertson took to basketball as his sport of choice, and by the time he entered the all-black Crispus Attucks High School in 1953 he had developed the skills that would make him one of the greatest to ever play the game. Robertson’s coach at Crispus Attucks was Ray Crowe, the legendary high school coach who helped the budding star hone his skills. Robertson led his team to the 1955 State Championship, making Crisps Attucks the first all-black school in the nation to win a state championship. The next year, as a senior, Oscar Robertson led his team to a repeat as state champs and was named Indiana’s “Mr. Basketball.” The future was now wide open for this emerging star of the game. 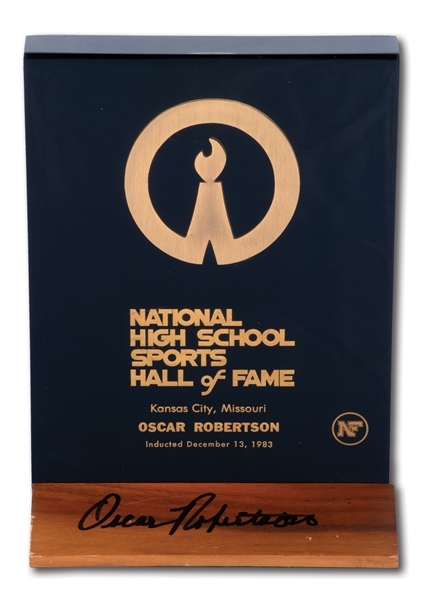 In 1983, Oscar was inducted into the National High School Sports Hall of Fame, and this is the lovely award he received for this honor. The 7” x 10” plaque is mounted on a 4.5" x 7” wood base which Robertson has signed in bold black marker. The 4-lb. piece shows just light wear from age and display. A stately award that honors The Big O’s early days as a hopeful high schooler with the whole world ahead of him. Includes LOA from Oscar Robertson.